The Journal of Retina&Vitreous is a double-blind peerreviewed, international periodical about retina and vitreous. The publication languages are Turkish and English. 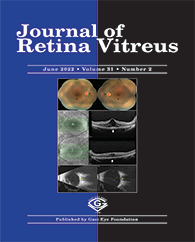 The Journal of Retina&Vitreous is published quarterly (March, June, September and December). The aim of the Journal of Retina&Vitreous is to publish research articles on original issues of the highest clinical and scientific quality at international level. Along with this aim it publishes reviews, short editorials articles, original case reports and figures covering fundamental innovations dealing with education. The required knowledge for primary aid practitioners, family practitioners and public health specialists along with ophthalmology specialists is assessed and relevant issues are addressed in the Journal of Retina&Vitreous. The journal’s editorial and publishing process is adherent to standarts of ICMJE and COPE. Any of the articles, drawings, figures and tables published in Journal of Retina&Vitreous can not be published or reproduced in whole or in part without the prior written permission of the publisher. For scientific purposes (on contition that the reference is expressed) summerizing and quatations can be done. The authors are responsible for their articles, figures and photos and the companies are responsible for their advertisements. Retina vitreous and Glaucoma cataract journals have been included in the indexes listed below since 2007.